In January 2017, during a workshop organized at FRS, Dr. Lassina Zerbo, Executive Secretary of the Comprehensive Nuclear-Test-Ban Treaty (CTBT) Organization, admitted that his view on the nuclear weapon ban treaty initiative was slowly moving. While he tended to think initially that it might be a disturbing process that would take the focus out of urging issues such as the entry into force of the CTBT, he was more and more receptive to the arguments made by proponents of the ban. In particularly, he was increasingly convinced that it might be an opportunity to recreate momentum in favor of disarmament and push Nuclear-Weapons States (NWS) to take seriously their commitment in this matter. This explanation and evolution is interesting, as Dr. Zerbo is a paramount actor in the field of nonproliferation and disarmament, and is in the habit of taking into account the points of view of all members of the international community. More fundamentally, this hesitation on the benefits expected from the nuclear ban treaty is a reminder that most countries and analysts are hoping for the emergence of a world free of nuclear weapons. The disagreements are on the most efficient ways to get there. In this regard, the discussion on a ban can be seen as a change of paradigm, as for many decades, it was agreed by most actors that disarmament could only be the fruit of a gradual and laborious diplomatic work. It represents therefore a methodological shift, which justifies the strong reactions and arguments between the “pro” and “anti” ban treaty. The current drive to ban nuclear weapons finds its roots in the movement on the humanitarian consequences of nuclear weapons, which picked up steam in 2013 with the organization of a first international conference in Oslo. This gathering was followed up in February 2014 in Nayarit, Mexico, and lastly in Vienna in December 2014. The objective of this conference was initially to bring a new perspective on the consequences of the use of nuclear weapons, by involving scientists working on the nature of radiations as well as survivors from explosions. Heather Williams, “Oslo Rumors and Realities: The Way Ahead for the Humanitarian Impacts of Nuclear Weapons Initiative,” European Leadership Network, 3 September 2013. However, it soon appeared that while important work was being put forward, a group of participants had in mind to use the conferences as a platform to promote the opening of negotiations of a treaty banning nuclear weapons. Heather Williams, “Humanitarian Impacts of Nuclear Weapons: Where is this Going?,” European Leadership Network, 25 March 2014. These efforts culminated in the adoption of a “Pledge”, proposed by Austria in December 2014 and later signed by 159 countries, calling for the adoption of a legally-binding instrument banning nuclear weapons. Pledge presented at the Vienna Conference on the Humanitarian Impact of Nuclear Weapons by Austrian Deputy Foreign Minister Michael Linhart, 9 December 2014. A year later, the Review Conference of the Non-Proliferation Treaty (NPT) was unable to adopt a consensual final document. The pace of disarmament proved to be one of the major contentious issues. Tariq Rauf, “The 2015 NPT Review Conference: setting the record straight,” SIPRI, 24 June 2015. Following this disappointing conference, a working group was formed in the side of the United Nations General Assembly (UNGA) and tasked with proposing new steps to promote nuclear disarmament. One of its recommendation, published in August 2016 was to pursue negotiations on a ban treaty. Report of the Open-ended Working Group taking forward multilateral nuclear disarmament, 19 August 2016. With the support of a group of states including Ireland, Mexico, Austria, Brazil, Nigeria, and South Africa, it was formally endorsed by the UNGA First Committee during a vote on October 17, 2016 (123 for, 38 against) and the General Assembly on December 26, 2016 (113 for, 35 against). Seventy-first session First Committee Agenda item 98 (kk) General and complete disarmament: taking forward multilateral nuclear disarmament negotiations, A/C.1/71/L.41. 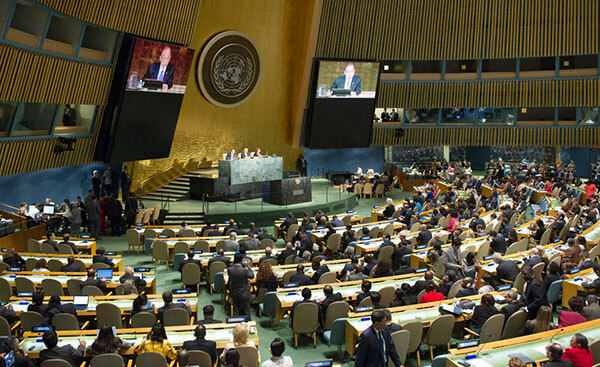 The resolution adopted “decides to convene in 2017 a United Nations conference to negotiate a legally binding instrument to prohibit nuclear weapons, leading towards their total elimination; encourages all Member States to participate in the conference; [and] decides that the conference shall convene in New York, under the rules of procedure of the General Assembly unless otherwise agreed by the conference, from 27 to 31 March and from 15 June to 7 July 2017, with the participation and contribution of international organizations and civil society representatives.” Resolution adopted by the General Assembly on 23 December 2016, 71/258. Taking forward multilateral nuclear disarmament negotiations. Supporters of a treaty recognize that its adoption will not yield results overnight, but are confident that it will demonstrate the concern of the majority of the international community regarding the devastating humanitarian consequences of these weapon systems, the lack of progress in recent years in effective disarmament and what is perceived as an increased risk of use given the level of tensions between various NWS. They therefore see it as a first step which will correct one abnormality, often referred as a legal gap (the absence of international norm prohibiting the most destructive kind of WMDs) and lead to a new momentum to move out of the current stalemate. On the opposite side, official arguments used by NWS such as the United States, the United Kingdom and France, point at the misconception of separating the issue from international security concerns, the risk of diverting energy from concrete efforts to move forward on the disarmament path and the possible detrimental effect on the NPT. Are these arguments rhetorical talking points made by privileged states clinging to the benefits of an unfair system? Or is there a real risk of damaging a regime based on a subtle equilibrium between three equally-important objectives (disarmament, nonproliferation and peaceful use)? What can be the impact of the initiative and can it lead to the renewal of a constructive dialogue between each side? As the negotiations are about to begin, these questions must be addressed in a serious fashion. It must be acknowledged however that as this process is in its early stage, is quite unique, and as much is still unclear on the content of the ban treaty (scope of prohibition, methods, verification…) it is still impossible to make a sure assessment of what the long-term of the negotiations will be. While some militant groups have always called for immediate and general nuclear disarmament, the history of the NPT tends to show that a gradual approach has generally been perceived as the most realistic and efficient. This process has led to many progresses in the past years, even if the pace has noticeably slowed down. Article VI of the NPT, signed in 1968 and extended indefinitely in 1995, states that “each of the Parties to the Treaty undertakes to pursue negotiations in good faith on effective measures relating to cessation of the nuclear arms race at an early date and to nuclear disarmament, and on a treaty on general and complete disarmament under strict and effective international control.” This commitment has been interpreted over the years as one part of a grand bargain: non-nuclear weapons states (NNWS) would agree not to develop a military program while NWS would progressively renounce to their arsenals. The implication of Article VI must not be overstated. As can be seen by its vague formulation and a study of the archives of the negotiations, disarmament promises were not at the root of the decisions of the majority of the international community to adhere to the NPT. Most were convinced that their security interests were served by a Treaty that prevented most states to access nuclear weapons. Matthew Harries, “Disarmament as Politics: Lessons From the Negotiation of NPT Article VI,” Chatham House Research Paper, 13 May 2015. That being said, many actors have changed their interpretation of the Treaty’s main priorities over the years. It is increasingly obvious that for some NNWS today, the NPT should mostly be aiming at disarmament, and that its two other goals, nonproliferation and peaceful uses of nuclear energy, are of secondary importance. Heather Williams, “Does the fight over a nuclear weapons ban threaten global stability?,” Bulletin of the Atomic Scientist, 9 February 2017. They tend to affirm therefore that they only accepted the indefinite extension in 1995 provided progresses were made on the disarmament pillar of the Treaty. Whether or not this position is historically justified, it fuels an expectation, every five years, during the Review Conference of the NPT, of holding NWS accountable on Article VI. Starting in 1995, a consensus existed on the fact that progress in that direction could only be made incrementally, which led to the adoption of several action plans and intermediary objectives. In 2000, the NPT Review Conference adopted a Final document which included 13 practical steps for disarmament. These steps notably included the entry into force of the Comprehensive Test Ban Treaty (CTBT), the beginning of negotiation on a treaty banning the production of military-oriented fissile material, a reduction of the role of nuclear weapons, and work on the measures necessary for a complete and verifiable nuclear disarmament. In 2010, this approach was renewed with the adoption of the Action Plan, which comported 64 measures and 22 on the disarmament pillar. This plan was heterogeneous with some actions being very concrete and others reflecting vaguer commitments. As could be expected for such an ambitious undertaking, as States parties gathered in New York for the 2015 Review Conference, the level of implementation of the plan varied. Some actions were perceived as completed (“initiate a process towards the dismantling or conversion for peaceful uses of facilities for the production of fissile material for use in nuclear weapons”, “promote the entry into force and implementation of the CTBT”), but others were still at a standstill (“the Conference on Disarmament should immediately establish a subsidiary body to deal with nuclear disarmament, within the context of an agreed, comprehensive and balanced programme of work”, “the nuclear-weapon States commit to undertake further efforts to reduce and ultimately eliminate all types of nuclear weapons, deployed and non-deployed, including through unilateral, bilateral, regional and multilateral measures”). Gabriella Gandenberger, Mia Irsten, and Ray Acheson, NPT Action Plan monitoring report March 2015, Reaching Critical Will, 2015. Lack of progress in 2015 and beyond? Despite the few elements of progress initiated by NWS between 2010 and 2015, and especially the ratification of the New Start Treaty, the development of the international monitoring system of the CTBTO or the attempt to be more transparent on capacities and doctrines, it was generally agreed that not enough had been achieved within the timeframe of the review cycle. Gaukhar Mukhatzhanova, 2015 Monitoring Report: Implementation of the 2010 NPT Action Plan, Disarmament Actions 1-22, James Martin Center for Nonproliferation Studies, Middlebury Institute of International Studies, April 2015. The arguments put forward by NWS to explain their inability to complete most of the 22 actions have generally not been accepted as good excuses by a wide part of the international community. In fact, most concrete steps taken (such as for instance the publication of a glossary of nuclear terms) have been seen as almost ridicule and inconsequential. Richard Lennane, “NPT Review Conference 2015,” Wildfire, 2015. In this context, the step-by-step approach and the review of the Action Plan has been sidelined to some extent and was left out of most of the debates on the drafting of a final document. The integration of the conclusions of the humanitarian initiative was seen as more important by a vast number of NNWS. With the negotiation of a ban treaty, it is difficult to imagine how the opening review cycle will be able to modify this situation. The first indication will be the Preparatory Committee that will take place from May 2 to May 12 in Vienna, Austria. Few expect this meeting to build the bridge between two processes and two approaches that seem increasingly irreconcilable. Nuclear non-proliferation: planning for 2020 (WP1498), Annual Conference, Wilton Park, 5-9 December 2016. The outcome of the March negotiation will probably play a big role in the relevance of the review cycle, as will the evolution of the NWS nuclear arsenals. Unfortunately, the context for nuclear disarmament in the coming five years does not look very promising. It is therefore unlikely that any initiatives achieved by 2020 will be seen by the most militant NNWS as a satisfactory implementation of the Article VI of the NPT, which will make the ban treaty all the more relevant in their eyes. The greatest progresses achieved in the field of nuclear disarmament, especially in the 1990s, came from a combined influence of reduced tensions between nuclear powers which enabled the adoption of ambitious arms control measures. The current situation is quite different on both accounts. The great majority of nuclear weapons are still in the control of Russia and the United States. The tense relations between the two countries result in an atmosphere more conducive to arms race than arms control. As both countries are in the process (more or less advanced) of renewing their nuclear capacities, preserving and extending existing frameworks, such as the New Start Treaty which caps the arsenals of both countries, is already challenging. Earlier propositions for further reductions, made by President Obama, have been rejected by Moscow which would prefer to get out of the bilateral setting and associate other NWS to the talks, and insist on settling the disagreements on the deployment of ballistic missile defense before any further reductions. “Russia Signals its Interest in More Nuke Cuts Does Not Match Obama's,” NTI, 20 June 2013. The new Republican administration in Washington and the US Congress do not seem to see the reduction of the number of weapons as a priority as budgetary efforts are going to be made on the modernization of all components of the nuclear Triad. Of course, it is difficult to predict the policies that will be adopted by President Trump, as he stated that he was not afraid of a new arms race but also proposed dropping sanctions against Russia in exchange of an arms control deal. Joe Uchill, “Russians not sold on Trump offer to link sanctions relief to arms control: report”, The Hill, 17 January 2017. However, the odds of an ambitious reduction of American and Russian arsenals are not bright. Russia depends on its nuclear weapons to offset its conventional weakness vis-à-vis NATO and sees its arsenal as an instrument of “prestige”. This calculation is enhanced by American developments such as the progressive deployment of ballistic missile defense systems or the work on a conventional prompt global strike, which is perceived by Moscow as a potential threat for Russian strategic assets. This is not to say that an agreement could not be found to adopt new quantitative caps, but that it will require a real political will on both sides which is currently lacking and that it would probably not be, in the current circumstances, extremely ambitious. Alexey Arbatov, “An Unnoticed Crisis: The End of History for Nuclear Arms Control?,” Carnegie Moscow Paper, 16 June 2015. The very issue of arms control among the two states is controversial as the compliance to major treaties is being contested. The most obvious example is the Intermediary Nuclear Forces (INF) Treaty of 1987, which is according to the State Department violated by Russia. Steven Pifer, “The future of US–Russian arms control,” Brookings Institution, 26 February 2016. The American and Russian deadlock remains central on this issue because of the sheer number of warheads involved. That being said, other regions are going through tensions which make disarmament a difficult prospect. For instance, China is still working on the development of its nuclear program to reach what it considers minimum credible deterrence. Outside the NPT, several crises are increasingly involving deterrence dynamics. Far from considering disarmament or arms control, the Pakistanis and the Indians are also building up their respective arsenals, which are seen as key to their national security. More discreetly, there is no foreseeable path for an Israeli move towards renouncing its strategic assets, which is one of the blocking point in the creation of a WMD-Free Zone in the Middle East. This issue was also bitterly debated during the 2015 NPT Review Conference. Finally, the perspective of the denuclearization of the Korean peninsula is becoming more and more remote as Pyongyang is developing sophisticated weapon systems and delivery vehicles. It is therefore undeniable that nuclear deterrence is playing a larger role in international security, in Northeast Asia, South Asia and even in Europe, where it had long been considered an issue of the past and is now seen in a new light as tensions grow between NATO and the Russian Federation and as the nuclear dimension of any crisis between the two is becoming more perceptible. Unilateral or bilateral disarmament is therefore out of favor, and it would probably require an important change of the global context to put it back on the agenda of nuclear powers. Unfortunately, multilateral engagement is also challenged which means that tangible progresses are even more difficult to achieve. The most obvious manifestation of the difficulties encountered by multilateral disarmament has been the incapacity of the UN Conference on Disarmament in Geneva to agree on a program of work since 1999. As a result, the last work conducted within this forum was the adoption of the CTBT in 1996. Its current stalemate is mostly due to the inability to move forward on the negotiations of a Fissile Material Cut-off Treaty, and more precisely to the refusal of Pakistan to let talks on such a treaty take place. As long as this obstacle is not removed, the Conference on Disarmament will remain a forum deprived of any negotiating capacity and only dedicated to official posturing among the 65 delegations. The Fissile Material Cut-off Treaty (FMCT) is not the only multilateral initiative confronted to difficulties. Twenty years after its adoption, the CTBT is still not officially into force, as eight states of the Annex Two list have not ratified it yet. Despite the work done by the Preparatory Commission and the technical expertise of the Viennese organization, provided thanks to an extensive monitoring system, the endeavors to ban nuclear testing can therefore not yet be considered as achieved. International actions aiming at curbing WMD proliferation are also facing obstacles. The recent past has seen the successful process leading to the adoption of a nuclear deal between Iran and six states (E3+3). But despite this achievement, which put a lid on more than twenty years of diplomatic confrontation, non-proliferation is perceived with renewed suspicion. Said more clearly, many states are resisting new attempts to control, monitor or restraint access to certain technologies and materials. This is illustrated by the strong resistance of some countries (Brazil, Argentina, Egypt) to adopt measures such as the IAEA additional protocols, which gives the Agency more tools to guarantee that a state is not involved in any illegal nuclear activities. Their position can be summed up by the declaration of a Brazilian representative in 2008 who stated that Brazil “will not adhere to amendments to the Treaty on the Non-Proliferation of Nuclear Weapons extending the restrictions of the Treaty, until the nuclear weapon states advance in the central premise of the Treaty: their own nuclear disarmament.” Toby Dalton, Togzhan Kassenova and Lauryn Williams (eds. ), Perspectives on the evolving nuclear order, Carnegie Endowment for International Peace, 2016. Given this lack of prospect in all traditional forums dedicated to disarmament, it is no wonder that states for whom it is a priority have decided to look for another avenue, which turned out to be the humanitarian initiative and will in all likelihood end up in the adoption of a treaty banning nuclear weapons. This outlook is creating a lot of hope around the world, and a genuine belief that disarmament will find a new momentum. The partisans of a nuclear ban realize that NWS are not going to join any treaty, or even participate in the negotiations that will lead to its adoption. Most NATO allies or states benefiting from the nuclear umbrella are also going to decline any involvement in the project, as was shown by Germany’s official statement on the issue. Letter from Ms. Susanne Baumann to NGOs, 9 February 2017. However, they are convinced that they will be unable to completely ignore the international call in favor of nuclear weapons abolition. The first argument generally used is the power of merely creating a new international legal norm. There is a conviction that this will be the most efficient way to show that a large majority of states are opposed to the possession of nuclear weapons by a few, and that it will create an incentive for NWS to take action whether they want it or not. Ban Nuclear Weapons Now, ICAN. The precedents which are generally quoted are the adoption of the Ottawa Treaty banning landmines and the Convention on Cluster Munitions. In both cases, the initiatives have not been universal and in particular the United States and China did not ratify them, but for their proponents, these conventions had a global impact and non-signatory states modified their policies to take into account the new norms. Jean-Marie Collin, “L’Assemblée générale de l’ONU ouvre la porte à un traité d’interdiction des armes nucléaires”, Note d’Analyse, GRIP, 9 December 2016. The hope is therefore that feeling the condemnation from a majority of counties and from groups within nuclear weapons states, NWS will feel compelled to modify their nuclear strategies and constrained in the modernization and deployment of their capacities. Ban-promoters are especially hopeful that NATO members and American allies in Asia will be the most sensitive to this pressure. Concretely, they believe that public opinion in some of these states, which is already rather skeptical if not hostile to NATO’s nuclear policy, could be reinvigorated by the ban and use it politically to support their agenda. In the six NATO states hosting nuclear weapons, they could in particular be helped by this new norm in their efforts to get rid of the B-61 nuclear weapons deployed on their territories and obtain the end of the Alliance’s nuclear sharing arrangements. The fact that the proposed ban treaty’s potential effect would be bigger in “umbrella states” has been recognized by NGOs working on the process, and they have not shied away from admitting that these states should be the main target from the movement. Xanthe Hall, “Under Pressure Nuclear weapons states react angrily to plans for nuclear treaty,” ICAN Germany, 3 November 2016. States promoting it have also confessed that they hoped that the ban would have an impact in “open, democratic societies”, by creating a mobilization of civil society which could let to a change of policy. Hellmut Lagos, “Disarmament and Deterrence - Bridging the Divide,” EU Non-Proliferation and Disarmament Conference 2016 First Plenary Session, 3 November 2016. Even if it does not lead to the abandonment of nuclear deterrence by NWS and their allies, the treaty is a way for some to push them to make more efforts and to realize that they cannot keep disappointing the major part of the international community on the implementation of the Article VI commitment. It is therefore believed that thanks to this mobilization, NWS will take the issue more seriously and understand that they have no choice but to give satisfaction to NNWS. Many believe that this new pressure will not come only from the existence of the new norm, but also some concrete impacts that may come from the adoption of the treaty, such as the prohibition for banking institutions and business to cooperate with companies working on nuclear weapons programs, A Treaty Banning Nuclear Weapons, Developing a legal framework for the prohibition and elimination of nuclear weapons, Article 36. or the interdiction for signatories of the treaty to participate to military exercises involving nuclear deterrence. United States Non-Paper: Defense Impacts of Potential United Nations General Assembly Nuclear Weapons Ban Treaty, 17 October 2016. By raising awareness and making it at the center of the non-proliferation agenda, but also by trying to get public opinions and non-governmental organizations involved, including religious groups, supporters of the treaty hope that it will by itself work as an incentive for more efforts on disarmament and help break the current deadlock. Colum Lynch, “U.S. Seeks to Scupper Proposed Ban on Nuclear Arms,” Foreign Policy, 21 October 2016. They also want it to reinforce the taboo on nuclear weapons. If it fails to bring about new achievements in terms of disarmament, the treaty should at least be able to reinforce progressively the stigma against nuclear weapons and make clear for all countries that they are WMDs rejected by a major part of the world which should never be used and especially not be used as normal weapons. The question of de-legitimization is very important, especially in the current context. Marc Finaud, “The UN Vote On A Nuclear Weapons Ban: A Moment Of Truth?,” Global Insight, GCSP, 31 October 2016. Up until a few years, it was generally believed that the nuclear taboo was quite strong. But the recent tensions between NATO and Russia, the ongoing crisis between Pakistan and India and the general lack of stability in Asia means that the risk of a nuclear detonation is considered on the rise and that nuclear threats or gesticulations are being observed too frequently. The initiative therefore may also remind NWS of the risks of escalation and of their obligation to avoid the use of these weapons at all costs. This stigmatization of the weapons is seen as a contestation of the traditional rhetoric associated to NWS, according to which some could safely adopt a policy of deterrence while others would be considered as proliferators and condemned by the international community. In the eyes of defenders of the ban, it is not a question of who is in possession of the weapons, they are inacceptable and illegitimate in any conditions. Beatrice Fihn, “Stigmatize and Prohibit: New UN Talks on Nuclear Weapons Start Today,” The World Post, 21 February 2016. This argument is getting traction as what were seen as “responsible” and “rational” nuclear powers are not perceived with the same level of trust. The case of Russia has already been evoked. The election of Donald Trump in the United States is provoking a new movement of skepticism vis-à-vis Washington, and even the American public is re-discovering with anxiety the fact that President Trump is at the head of the arsenal without any checks. Alex Wallerstein, “No one can stop President Trump from using nuclear weapons. That’s by design.,” The Washington Post, 1 December 2016. The lack of predictability of the new President means for some that banning nuclear weapons is more useful than ever, as no single man should be left with the responsibility of dealing with such a destructive capacity. Ira Helfand, “The full meaning of Donald Trump's finger on the nuclear button,” CNN, 18 January 2017. In this regard, the need to delegitimize nuclear weapons does not imply the adoption of a very detailed and concrete convention at this stage: the treaty with general principle is seen as an interim measure that will play its role of reinforcing the taboo and emphasizing that nuclear weapons are unacceptable no matter who the possessor. Joelien Pretorius, “The ban treaty: An interim step, but politically profound,” Bulletin of the Atomic Scientists, 14 December 2016. It is also the symbol of an attempt to change the general concept of international security. For the most optimistic, the ban will prove that collective security is not assured by each state pursuing its own national interests in a narrow perspective, but by all agreeing to norms which enhance global security. The conferences on the humanitarian consequences of nuclear weapons have consistently showed that the decisions made by NWS regarding their arsenals and that could lead to a detonation, voluntarily or not, impact the future of all mankind. Research focused in particular on the outcome of a “limited strike” and estimated the loss of human life, direct and indirect, but also the impact in terms of environment, temperature on the surface of the earth, agriculture, epidemics and global disruption. Rebecca Johnson, Preventing Nuclear Use: The Humanitarian Imperative For Nuclear Disarmament, ISODARCO Beijing, October 31-November 2, 2012. States who support the ban understand the role of nuclear weapons in the security doctrines of NWS, but for them, the benefits expected by a few dozen states pale in comparison to the risk unwillingly endorsed by more than a hundred others. Moreover, the fact that the fate of their population might depend on brinkmanship strategies of a few individuals thousands of miles away is seen as unfair and absurd. Thomas Nash, Statement on nuclear weapons and security to UN talks, Open Ended Working Group at the UN in Geneva, 12 May 2016. Finally, they note that security policies should better integrate humanitarian concerns. In that view, the international community should be able to ban weapons if they are judged to be fundamentally inhumane and leading to catastrophic humanitarian disasters. Beatrice Fihn, “The Logic of Banning Nuclear Weapons,” Survival, vol. 59, n°1, February-March 2017. Even if they realize that it will take time to bring about a real change in strategies and doctrines, many NNWS believe that the adoption of the ban will be a first step that will support a concept of global cooperative security, and show their refusal to be the hostage of major powers. From concrete elements, such as complicating the financial investment in nuclear weapon manufacturers, to strategic expectations, as the de-legitimization of weapons, and global objectives, such as the recognition of a collective security based on cooperation and not the defense of national interests, ban promoters are convinced that the treaty will be step in the good direction and a breakthrough towards a world free of nuclear weapons. Their main assumption is that given the lack of momentum of the present situation, there is little to lose in trying a new strategy and that any new initiative will be better than the current standstill. The assessment of this bet is difficult to make as the text is not adopted yet, and could take various forms. It is commonly expected that it will be rather simple and vague, which would make it much easier to negotiate. In that case, it could be adopted rapidly and preserve the consensus among the states promoting it. But it would have little concrete impact and would therefore remain mostly symbolic. On the other hand, some states could insist to make it a major step forward and not only the repetition of earlier commitments. This could create obligations among signatories which would modify their relationship with nuclear weapons states. In any case, the ban supporters are convinced that it will re-create momentum for disarmament without threatening in any ways the existing frameworks. However, its opponents feel that it will make disarmament even more difficult and point at the risk associated with such a legal instrument. Even since the idea of a nuclear ban was formulated, NWS and their closest allies have repeatedly stated that it would hurt the NPT. The main risk is a decreased credibility which will mean that the text is no longer seen as the “cornerstone” of the global nuclear order and a priority is implicitly given to the pillar dedicated to disarmament at the expenses of the two others. Robert Wood, “Remarks at the 71st Session of the General Assembly First Committee Thematic Discussion on Nuclear Weapons,” New York, 14 October 2016. There are very little chance to see a movement of withdrawal or violation of the NPT follow the adoption of the treaty. It would make no sense for states to work for the prohibition of these weapons and at the same time renounce their commitments not to develop them. Besides, programs of this nature are usually justified by strong security imperatives and domestic factors, they could probably not take their sole origin in the lack of faith of a state in the solidity of a multilateral treaty. The risk anticipated is therefore in all likelihood less extreme, but concerns the lack of cohesion by member states in making sure the treaty is implemented. Said otherwise, there is a palpable fear that as they shift their attention to prohibiting the weapons, some stakeholders will be less worried about violations of the NPT and not be as ready to support actions taken to sanction violations. In the two main proliferation crisis of the last decades, building international unity to adopt Security Council resolutions and sanctions against Iran and North Korea was already a real diplomatic achievement, and some divergences of views were already very clear. Tanya Ogilvie-White, “International Responses to Iranian Nuclear Defiance: The Non-Aligned Movement and the Issue of Non-Compliance,” The European Journal of International Law, vol. 18, n°3, 2007. The fear now expressed is that if such a situation was to happen again – and of course it could happen in particular in Iran where the regime could make the choice to go back on its commitments – resistance to firm multilateral action would be even stronger. There are two aspects in this question. First, the idea that promoters of the ban believe that the NPT is not properly implemented today and that nuclear weapons states are basically violating Article VI, especially because of their modernization programs. Article 36, “The effects of nuclear weapons under international law,” Briefing Paper, December 2014. It is therefore a question of assessing two different sets of violations, and to relativize the gravity of one compared to the other. This vision is not propitious to adopting stringent measures to counter proliferation efforts, as it assumes that violating Article I is not legally worse than Article VI and that the focus on one kind of transgression is excessive. The second notion is that the very nature of the weapons is illegitimate. Therefore, focusing on the behavior of some (nuclear tests of North Korea, clandestine activities in Iran, or even the destabilizing doctrines and policies of nuclear weapons states) would be missing the wood for the trees. Desmond Tutu, “Nuclear weapons must be eradicated for all our sakes,” The Guardian, 4 March 2013. This could ultimately lead to a complete questioning of the essential double-status of the NPT. Once again, this shift would not push states towards military capacities, but could lead them to be more lenient towards would-be proliferators. In that sense, there is a real threat that the NPT might not be as efficient as its members grow more fragmented and are less able to collectively ensure its implementation. This risk must be slightly nuanced as if states are convinced that a proliferation program is a threat to their national security, they would probably be ready to take action no matter what their views might be on the state of the NPT. Real politics would be expected to triumph over political posturing. It cannot however be disregarded. The other argument made by officials of NWS is that this new process will distract states from ongoing disarmament project, namely the universalization of the CTBT or the negotiation of the FMCT. According to this view, there will be little appetite in finding common ground and building bridges among various communities on these issues if the end goal of a concurrent initiative is complete disarmament. Tom Countryman, “Disarmament and Deterrence - Bridging the Divide,” EU Non-Proliferation and Disarmament Conference 2016 First Plenary Session, 3rd November 2016. On the contrary, some actors could feel that these gradual conventions are no longer necessary and cease to invest for their entry into force. This is not a minor problem. These instruments do and will require the active participation of all states. For instance, the CTBTO requires the financial and technical commitment of all to maintain its network of monitoring stations around the world and analyze data. On the FMCT, convincing Pakistan to change its position and working on the technicalities associated with a cut-off treaty will not be the concern of only nuclear weapons states and propositions and involvement of all participants to the Conference on disarmament will be essential. The same risk applies to non-proliferation in general and in specific cases. As said earlier, focusing on a ban might mean that for some countries, resolving proliferation crises might be of secondary importance. This feeling might be reinforce if the sentiment prevails that the Iran nuclear crisis has been solved once and for all. The first theater on which this “diversion” risk might be felt is North Korea. Of course, NWS are primarily concerned with solving diplomatically this crisis, as members of the UN Security Council. But all members of the UN are asked to implement the resolutions of the Council, for instance sanctions adopted against Pyongyang’s nuclear program. More generally, the international community has continually been improving the non-proliferation system, by taking into account past experiences but also technical innovations. An example of this is the strengthening of the guarantee system of the IAEA and the implementation of the additional protocols. Convincing promoters of the ban of the necessity to develop and update those measures might prove more and more difficult. Counter-proliferation initiatives, such as the Proliferation Security Initiative may also meet less enthusiasm. These trends were ongoing but the questions remain on the impact of the treaty on this phenomenon of “distraction.” On the one side, stakeholders assert that it is really not much to be distracted from. Michael Krepon, “The Nuclear Ban Treaty and Our Wobbly Nuclear Order,” Arms Control Wonk, 30 October 2016. Technically, there is nothing that prevents a state from investing for the universalization of the CTBT while supporting the ban. However, the question must be asked whether the political momentum will exist to preserve these subjects as priorities in various capitals. Announcing that the step by step approach has failed and is no longer pertinent can legitimately bring questions on the commitment to implement those steps. Once again, tedious diplomatic work might be necessary to convince actors that Treaties such as the CTBT or guarantees such as the Additional Protocol contribute to their security and are worthy of efforts to make them move forward. Lastly, one of the criticism associated with the ban is its lack of consideration for strategic realities. In that regard, it is for some “an exercise in futility“ Paulina Izewicz, “The nuclear ban treaty and its possible ramifications,” IISS Voices, 1st November 2016. at best, while others do not hesitate to talk of a “destructive, catastrophic and treacherous” move that could “thrust the world into chaos and instability.” Vladimir Yermakov, Representative of Russia to the UNGA First Committee, quoted by Kingston Reif, “UN Approves Start of Nuclear Ban Talks,” Arms Control Today, November 2016. In this view, the question is to know to what extent the ban will be benignly useless or will in fact create difficulties. For diplomats Robert Wood, “Remarks at the 71st Session of the General Assembly First Committee Thematic Discussion on Nuclear Weapons.” but also observers, ignoring strategic realities is dangerous. Not only it means that the reasons why some states rely on nuclear deterrence are disregarded, but it negates the fragile framework built by nuclear weapons states to insure strategic stability among themselves. On the one hand, this may mean that there is no shared recognition on the fact that some regional or global conflict need to be resolved before states feel safe enough to engage themselves into a disarmament process. Taking into consideration the fact that nuclear weapons are inherently dangerous and that they cannot help diffuse tensions between stakeholders, promoters of the ban insist on the necessity to disarm first and see other issues afterwards. This makes sense theoretically but is probably difficult to implement concretely as states are convinced that their national security depends on their nuclear arsenal. Bringing some level of confidence between states has to this day been a necessary first step to contemplating arms control measures and of course disarmament processes. In this regard, it often seen as extremely important to try to solve contentious issues between nuclear weapons adversaries, for instance the question of state-sponsored terrorism between Pakistan and India. George Perkovich, Not War, Not Peace: Motivating Pakistan to Prevent Cross-Border Terrorism, Oxford University Press India, New Delhi, 2016. That being said, saying that the subscribers of the Treaty will be less inclined to solve these very difficult problems might be reading way too much into an initiative that has yet to show its full scope. The second fear is maybe more interesting and questions the core of nuclear deterrence while asking the fundamental question: is nuclear deterrence beneficial for global stability? Does it play a role in preserving peace today between major powers? For those convinced that the answer is yes, making nuclear deterrence illegal without providing for a replacement is clearly dangerous. Heather Williams, “Why a Nuclear Weapons Ban is Unethical (For Now),” The RUSI Journal, vol. 161, n°2, April-May 2016. The idea is that the situation provoked by a sudden abandonment of nuclear weapons might be much worse than a world in which nuclear weapons exist but are not used as is the case today. The classic argument is that such a disarmament, without consideration of security concerns, may make the world “safe for conventional war.” Elbridge Colby, “Nuclear Weapons Aren’t Just For the Worst Case Scenario,” Foreign Policy, 4 August 2016. Threatening the existing arrangements of deterrence and extended deterrence may open the door to a world of uncertainty, insecurity, where the threat perception of many would dramatically increase, which would lead to unforeseeable developments but by no means coincide automatically with a safer world. This argument is interesting as it is true that given the place of nuclear weapons in national security doctrines of many countries, suppressing it would necessarily have a major impact, which was not the case for instance when other categories of weapons were suppressed such as biological weapons or cluster munitions. This impact is quite impossible to predict, and it is true that it is difficult to assess if the world would be more or less dangerous if the permanent threat of nuclear explosion was removed but other kinds of military contest appeared. That said, the treaty is not going to suppress nuclear deterrence in one stroke of pen, but try from the outside to attack its legitimacy. Its success in this matter might only be marginal, at least initially. It could therefore be described as “futile” as it will largely ignore the strategic realities of vast regions of the world and refuse to contemplate that deterrence and extended deterrence might be responsible at least partly for some stabilization and reinforcing the security of states. Qualifying it as “catastrophic” seems premature at this stage, given the fact that existing deterrence arrangements do not seem threatened. Finally, it should be recognized that the treaty and more generally the dynamic that led to its negotiation may be useful in reminding all actors of the dangers of the nuclear game. While deterrence may be useful in one time of history to prevent conflict, it would be very pessimistic, given its inherent risks, to imagine that it will remain forever the ideal relationship between powers. One of the fears we can legitimately entertain at this stage, because it has already started to materialize, is a divergence of expectations which will block any further discussion on non-proliferation and disarmament. Among the main supporters of the ban treaty, insisting on the urgency of disarmament and the implementation of the ban may mean that anything but the destruction of arsenals will be seen as disappointing at best and insignificant at worse. This “all of nothing” reasoning might be more visible in countries where public opinion is active, or where the diplomacy is very involved in the movement. Finally, it might be also quite popular in states which do not have a strong diplomatic team working on these issues and where the subtleties of arms control negotiations are not a tradition nor a priority. These states might be tempted with bandwagoning with the leaders of the movement and have little interest in supporting initiatives less ambitious than global abolition. As the treaty requires a clear positioning from diplomacies worldwide (voting for, against, abstaining), it will probably epitomize the disappearance of middle ground countries or bridge builders which were in the past decades instrumental in forging consensus between different groups and making measures such as the indefinite extension of the NPT possible. Jo-Ansie van Wyk, “South Africa’s Post-apartheid Nuclear Diplomacy: Practice and Principles,” Insights on Africa, vol. 7, n°2, 2015. Once again, this process is not due to the treaty which is more a symptom than a root cause for such a polarization, and it preceded it. Nonetheless, it tends to accentuate the simplification of the debate by putting states in front of a fallacious question: “are you in favor or against nuclear disarmament?” The credibility and power of persuasion of those refusing to join the negotiations will probably be very low among supporters of the ban, and it will be difficult to imagine the survival of groups such as the Non-Proliferation and Disarmament Initiative, which was active during previous NPT Review Conference, if its members hold different views on the treaty. The crystallization of two “camps” might be accelerated by the vote, and will probably not be very positive as it will erase shared interests along the lines, nuances and mutual challenges. Harald Muller, “The Nuclear Non-proliferation Treaty in Jeopardy? Internal Divisions and the Impact of World Politics,” The International Spectator, Italian Journal of International Affairs, 2017. The polarization effect may also be observable in the detractors of the ban. Because of their reliance on deterrence and internal considerations, these states have often considered the political and diplomatic benefits they could expect from disarmament measures. Such considerations were for instance visible in the commitment of President Obama not to produce any new nuclear warheads. Nuclear Posture Review Report, April 2010. Leaders of nuclear countries and people in charge of nuclear matters may feel now that it is useless to make further efforts as it is not going to be taken seriously and that the only satisfying measure they could take to please ban supporters would be unilateral disarmament, an unacceptable option. Abandoning the step by step approach might therefore lead to discouragement but also an open lack of good will. This posture could be emphasized when the domestic and international context makes it difficult for services working on disarmament to find an audience among policy-makers. A decreased interest for the respect of Article VI, and what could be interpreted as provocative declarations and actions, such as for instance statements on the increased role of deterrence or the development of arsenals, will mean that some NWS feel that they do not need to enter a bargaining game with the other camp and that they should pursue their interests with little attention to others’ considerations. This assumes that no concession is expected or needed from non-nuclear weapons states in the field of non-proliferation, a view which is not very consistent with the complexities of the challenges faced. The treaty will probably accelerate this polarization and make official that different groups have radically different expectations about the future of the NPT. But once again, all the blame should not be put on this instrument as the rift was already very visible before it entered the stage. To some extent, the divisions are going beyond the pure question of disarmament and reflect disagreement on underlying larger issues, such as the role of major powers as providers of international security, or topical situations such as the lack of resolution of the Israeli-Palestinian crisis which is partly behind the positions of the Arab League on a WMD free zone in the Middle East. The question is to see if there will be a “before” and “after” moment linked to the adoption of the treaty. Will it mean that this division will remain impossible to solve because the opposition on the ban will remain too fundamental to be overlooked? Will it mean that the degradation of relations within the international community on the NPT regime will become definite? The obvious victim of this polarization will be the NPT review cycle which will start with a Preparatory Committee in May 2017. It is dubious that this forum will be able to resolve any of the challenges posed by nuclear weapons, whether it be the difficulties of arms control, the North Korean crisis or other issues. More fundamentally, studies on a realistic path to zero have always emphasized the fact that while effective disarmament would always depend from an initial impetus from NWS, NNWS should be associated to the reflection as they will be required to participate in the definition and implementation of very stringent verification measures.Barry Blechman and Alexander Bolfass, eds., Elements of a Nuclear Disarmament Treaty, Stimson Center, Washington DC, 2010 and George Perkovic and James Acton, eds., Abolishing Nuclear Weapons: A Debate, Carnegie Endowment for International Peace, Washington DC, 2009. A lack of cooperation might delay the adoption of acceptable solutions in this regard. In this context, it can be hoped that the international community will not disregard future disarmament initiatives on the pretext that it is “not enough”. Similarly, NWS should not be dissuaded from engaging NNWS, for instance on the question of verification where interesting cooperation had already taken place. After the adoption of the treaty, it will be in the hands of national diplomacies to decide if they want to pursue a constructive role at all levels on these issues or if they want to remain stuck on this fundamental disagreement. Clearly, this new norm will be major political impediment and it will be difficult to convene in NPT preparatory committees and pretend it does not exist. Its assessment will probably take the center stage of the debates. This is why it is prudent to expect that it will constitute a major blocking point of the upcoming review cycle and that no major breakthrough on the three pillars of the NPT should be expected in the near future. In fact, some have expressed the fear that blocking the talks in the NPT dedicated forum might be the only tool in the hands of treaty promoters to try to have leverage on NWS and try to bring them into some level of compliance. The review process might in that view remain a long term hostage and casualty of this event. Michael Krepon, “Bombs, Bans, And Norms,” Arms Control Wonk, 6 November 2016. More positively, one might hope that after a few years of difficulty, concrete issues might arise which will convince the NPT community of the need to move past this point and agree on other measures. If this was to happen, states might be convinced by their national or regional interests to go back to a logic of mutually beneficial compromises helping solve the issues that will arise in the NPT regime as new technological developments appear and the strategic environment evolves. Another point to study is the resolution of the divisions produced by the treaty within some states. The treaty is clearly not perceived in the same way in all nations that oppose it. For instance, in France or in the US, it receives almost no media coverage and is not picked up in any way by the general public. Joe Cirincione, “The UN makes history on a nuclear weapons ban. Does the US care?,” Bulletin of the Atomic Scientists, 2 November 2016. In a few NATO states and in Japan in particular, this assessment must be nuanced as there is more traction among political parties to support disarmament and the governments have been criticized for their opposition to the treaty. Because of their role in nuclear-armed alliance, states like Germany find themselves in an uncomfortable position as they try to defend general disarmament through a step by step approach while they cannot forsake nuclear deterrence unilaterally in the very near term. These internal divisions, which can then be reflected at the NATO table, are not conclusive to playing a constructive role on these issues and contribute to the aforementioned disappearance of bridge builders able to take into account the expectations of all NPT state parties. Finally, the most divisive item that might result from this process remains a re-opening of the question of the legality of nuclear weapons, which was tentatively settled by the International Court of Justice in 1996. This seems to be the ultimate fear in NWS, as a different ruling could have more serious consequences for them than the treaty in itself. This outcome would not help the renewal of cooperation between NWS and NNWS on nuclear issues and would on the contrary lead to new disagreements, fractures and difficulties in preserving the non-proliferation regime. The adoption of a nuclear weapon ban treaty in 2017 or in the very short term is a quasi-certainty. What it will include and on what conditions it will be voted is much more speculative. This must be acknowledged to enable a fair discussion on its impacts – positive or negative – and what mitigating actions can be taken if it does have unfavorable outcomes. After this attempt of a balanced analysis of the arguments of the “pro” and “against,” it seems that the fear regarding the ban’s impact should not be overestimated. Most of its supporters still believe in the core issues of the NPT and have no interest in favoring proliferation of nuclear weapons. The instruments and layers implemented over the years (guarantees system of the IAEA, nuclear security initiatives, and obligations of the 1540 Resolution…) are not threatened directly. Moreover, as the treaty will not lead to the sudden elimination of nuclear weapons nor a serious debate in NWS, deterrence as a provider of stability and security will not suffer at least in the near term. Its benefits are difficult to predict: it is definitely already useful at this stage as it puts forward the risks linked to nuclear weapons and offers a condemnation of irresponsible behavior in that regard. It will probably contribute to strengthening the nuclear taboo. Depending on the shape it will take, it might have concrete impacts on the policy of states, especially umbrella states, although this is hard to ascertain at this stage. It usefully reminds the necessity not to give up on disarmament goal at a time of increased tensions. That being said, it seems impossible to deny that the consensus achieved to condemn the proliferation of WMD will probably be affected, as an important part of the international community will give the priority to disarmament. More specifically, it will be increasingly difficult to make sure that the NPT is a flexible and responsive instrument preventing proliferation and to hold violators accountable, since the Review process of the Treaty is bound to be blocked for a number of years. The ban treaty must not be blamed for trends that it is only reflecting. The opposition between the first two pillars of the NPT are not new and the dispute on the relative importance of disarmament and non-proliferation neither. However, it is undeniable that the treaty may crystallize this polarization and make future compromises even more difficult, as expectations will diverge and camps will become more hermetic. More than a diversion, it might therefore be preferable to talk for the moment of a stumbling block which is a result of the crisis of the arms control and nonproliferation regime but will make it harder to solve. Or said otherwise, it might become a hindrance and have a detrimental effect if the situation regarding disarmament were to evolve favorably, or if a new proliferation crisis occurred, and the international community could find it uneasy to put it in a corner and move forward in a united fashion on a shared agenda. Given this assessment, a constructive approach remains the only possible option not to make it a permanent sticking point and hope bridging the gap in the coming years. On the one side, the treaty is not yet adopted, its text could take many forms and there is still a chance that it will support the main tenants of the NPT Adam Mount and Richard Nephew, “A nuclear weapons ban should first do no harm to the NPT,” The Bulletin of the Atomic Scientists, 7 March 2017. , as some of its promoters are not hostile to the text. On the other side, it must be admitted that it is the “only game in town”, and as there is no prospect for any other disarmament measure in the short term to sell, its opponents should take it for what it is and try to move forward. “A Nuclear Ban Treaty: prospects and issues,” Strategic Comments, vol. 22, n°28, September 2016. Abandoning multilateralism and all pretense that nuclear disarmament is an ultimate shared goal would be uselessly provocative and would not contribute to moving forward on common interests. The priority is to convince leaders of the initiative that the non-proliferation regime is worth preserving and must not be eclipsed by a text that would only prioritize disarmament. To do that, pursuing in good faith the incremental process, through arms control measures, following up on the FMCT and the CTBT, working on verification or promoting stabilizing doctrines and force structures can only be beneficial. It will not be possible to hide the fact that the context is not propitious for major developments. But it should not be abandoned as ultimate objective. On the side of promoters of the ban, states and NGOs, there is an opportunity to prove that they are not unrealistic radicals but on the contrary are fully aware of the challenges and difficulties ahead and are ready to help NWS in tackling them. To do this, they will have a chance to insist on the normative aspect and the ultimate goal of the treaty, without rejecting intermediary steps if they were to be proposed. Finally, as was stated, they should recall that the treaty does not decrease the importance of the fight against the proliferation of WMDs and that they will be ready to play their part if any new crisis occurred, starting with the situation in North Korea. Bridging the gap will probably take many years and require positive evolutions of the international environment. Its definitive text will make it more or less easy to put aside to engage on cooperative work in nonproliferation forum. In the meantime and regardless its content, all parties should abstain from voluntarily ignoring the other’s security concerns and working in isolation, trends which are unfortunately quite visible at the international and domestic level in many countries.